I have been really thankful for my Instant Pot lately. Although Minnesota winters are always pretty cold, these past few days have been brutal. With windchills nearly reaching -40 degrees F –yes, MINUS 40 degrees–we haven’t got out of the house much. Being stuck in the house with a “threenager” is no joke. Arjun has so much energy that after tending to him I barely have time to make myself a cup of coffee, let alone cook. It’s ridiculous. So instead of making the trek to the grocery store, I’ve resolved to using up some of the foods I have in our freezer or pantry. 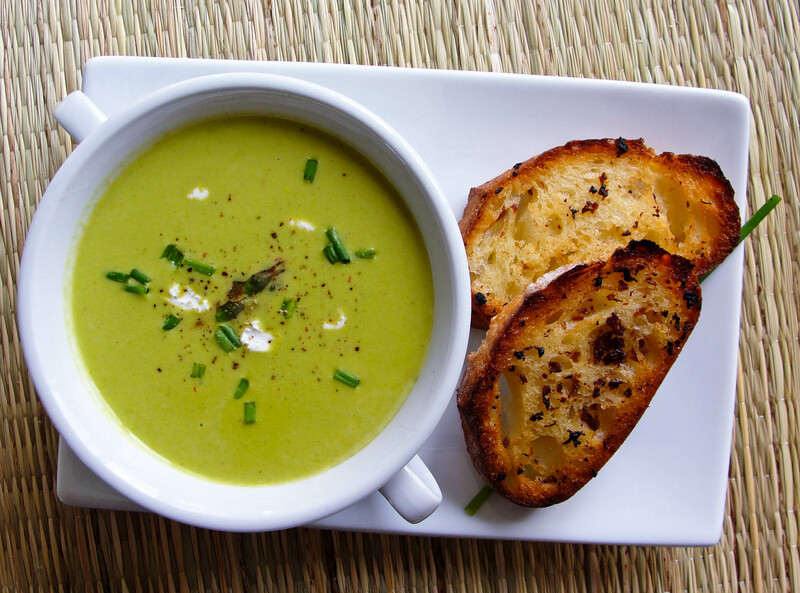 We’ve been enjoying a lot of soups lately, and this recipe has definitely been a favorite! Piyush said that it reminded him of Olive Garden’s Zuppa Toscana soup. I suppose it is sort of a copy-cat recipe, but having never ordered the Zuppa Toscana I can’t be sure how close it is. This entry was posted in Diet, Food, Recipes, Uncategorized on January 6, 2018 by Shari. 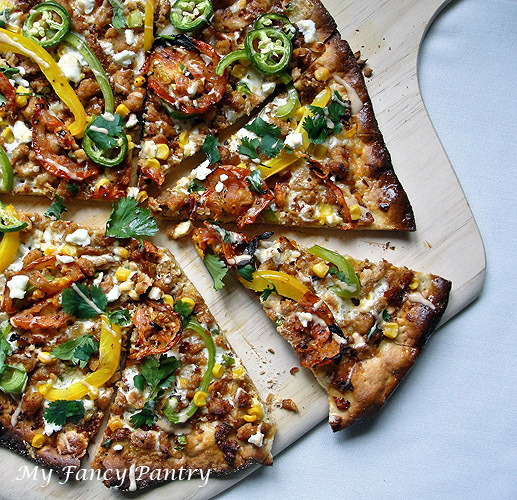 Spicy Chicken Sausage Pizza with Chipotle Pepper and Pepita Seed Pesto & Giveaway! So, Mona…you are the winner! I hope you enjoy your chicken sausages!!! You should be receiving an email soon! A couple weeks ago I received an email from Gold’n Plump asking me if I’d be interested in trying their new line of chicken sausages. I don’t typically buy Gold’n Plump products, so I didn’t really know anything about the company. I was surprised to learn that they are based out of St. Cloud, Minnesota–just a few hours drive from where we live. In fact, these chickens are probably more “local” than what I can get at my neighborhood butcher shop (sad, huh? )–and a whole lot cheaper than buying them straight from the farmer’s market/farmer. Now, if you read my blog regularly, you’re probably already aware that I’m pretty picky when purchasing my meat. I try to buy organic as much as possible, but sometimes that’s not always the practical thing to do. Do you know how much money 12lbs of organic, cage-free, vegetarian fed chicken breast for a potluck would cost me? A small fortune, I’m sure. It’s the sad reality. I replied to the email and asked a few questions about the chicken–what they’re fed, how they’re raised, and if they were given any hormones/antibiotics. I was satisfied with the responses I was given, so I agreed to give the chicken sausages a try. 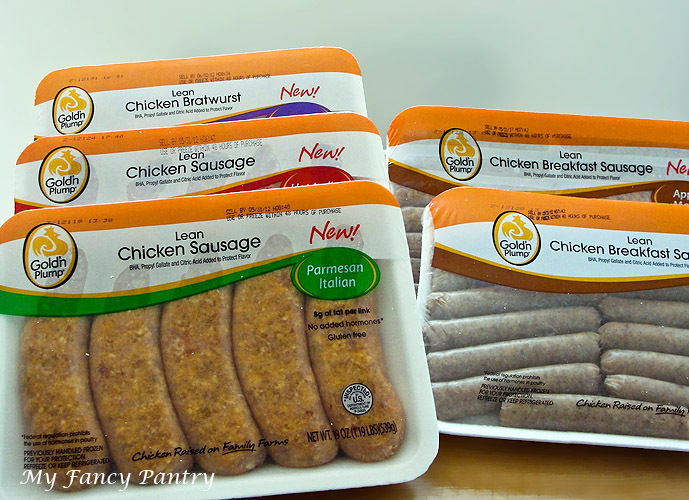 I was sent 4 different varieties to try: Lean Chicken Bratwurst, Lean Hot Italian Chicken Sausage, Lean Parmesan Italian Chicken Sausage and Lean Apple Maple Chicken Breakfast Sausage. I decided to try the Hot Italian Chicken Sausages first. 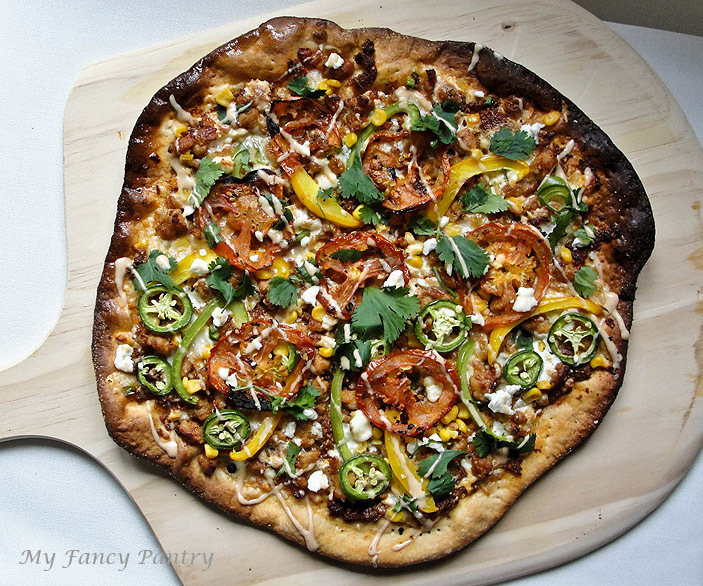 …And I had the perfect recipe in mind: Spicy Chicken Sausage Pizza with a Chipotle Pepper-Pepita Seed Pesto. Piyush always tells me how much he loves the chicken sausage pizza at Zpizza–a place he eats lunch at occasionally. He’s actually bought chicken sausages from Trader Joe’s, Hyvee, Walmart and Sam’s Club–trying to find one with the same taste as the one on that pizza. They all ended up in the garbage, and we continued to buy pork when we got the craving for sausages or brats. Sure, pork sausage is delicious; but it’s also incredibly fatty–definitely not good for my already over-expanded waistline. 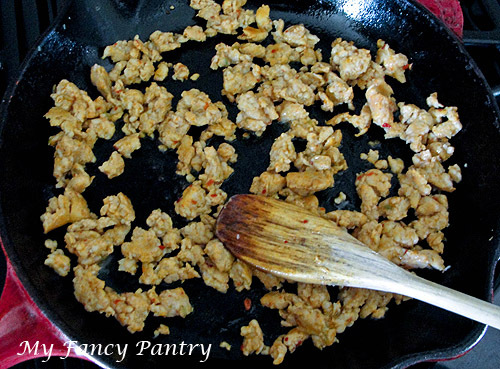 The spicy chicken sausage from Gold’n Plump contained 8 g. of fat and less than 180 calories per link. That is a whole lot healthier than pork! …and the apple maple breakfast sausages were 100 calories for 3 links–I say that’s awesome! I can’t wait to give those a try this weekend. Now, before I go on telling you what I think about the sausages, let me just state that yes, Gold’n Plump provided the sausages to me at no cost…but I will be honest, and all opinions/statements are completely my own. So, the nutrition stats look pretty good–aside from the sodium levels, but even that was less than most pork sausages I’ve bought in the past; and sausage is usually high in salt in the first place. But how was the taste? I removed the sausage from the casings so that I could top the pizza with ground meat instead of sliced. In my personal opinion–and Piyush’s too–the hot Italian sausage was definitely as good as any pork sausage we’ve tried. It was very well spiced (it actually is hot) and wasn’t dry at all. After I removed the sausage from the casings (I wanted ground meat instead of sliced rings–although Piyush would have preferred I kept the sausages in the casings), I cooked it in a little olive oil until it browned up nicely. Because Piyush loved the chicken sausage pizza from Zpizza, I thought it would be fun to make my own version. I’ve never tried a slice before…so I went to their website and checked out the toppings. 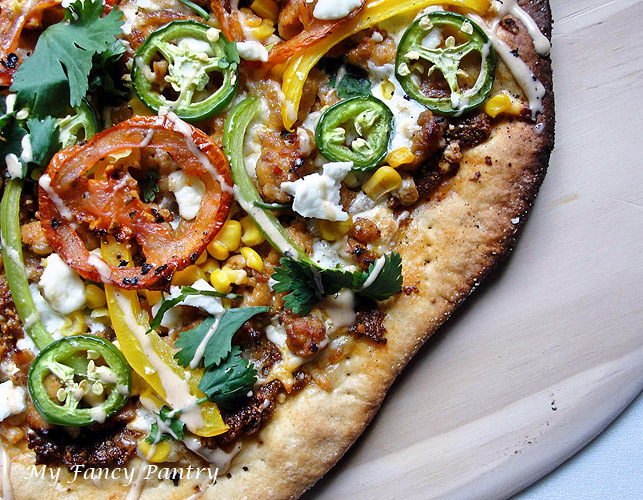 It had chipotle pesto, red onions, corn, chicken sausage, mozzerella, tomatoes, cilantro and serrano chilies–it sounded fantastic! I wish I would have thought of it first and could take all the credit, but no…instead I’m offering my version of Zpizza’s Santa Fe (which Piyush told me is nothing like their version—it’s different, but good on the exact same level. He really loves their pizza). Not only am I excited to share this crazy-good pizza recipe with you all, but I’m also excited because the nice people at Gold’n Plump have offered to send one of my readers the exact same chicken sausage sampler pack I received! 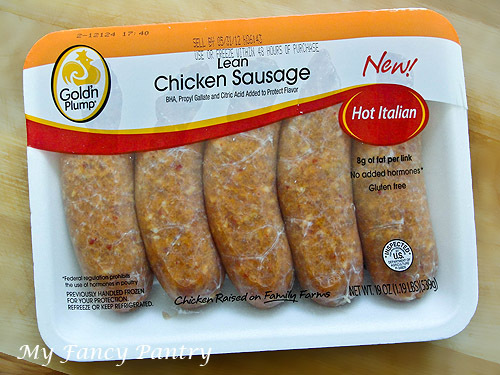 Gold’n Plump’s New Chicken Sausage Line: Parmesan Italian, Hot Italian, and Apple Maple Breakfast Sausages. There was also a package of Chicken Bratwurst. So lets talk about this Giveaway! What excites you about this new line of chicken sausages, and what you would make with them if you won? The giveaway ends Monday, June 4 at 7:00 p.m. Central Time. The giveaway is only open to U.S. residents– (sorry!). Be sure to include a valid email address with your comment…if you win, I’ve got to be able to contact you! I’ll choose the winner randomly using Random.org’s random number generator. If I don’t hear back from the winner by Wednesday, June 6 at 5:00 pm Central Time, a new winner will be chosen! If you click LIKE on Facebook or FOLLOW on Twitter, be sure to leave a separate comment letting me know, and if you already LIKE or FOLLOW, leave a comment about that too! In the mean time, if you’d like to try these sausages, you can head over to Gold’n Plump’s website and grab a $1.00 off coupon! They’re available at Super-Target (and some other stores too, I’m sure!). Now, let’s get back to the pizza! I used my basic whole wheat pizza crust recipe (using Indian Atta flour instead of regular whole wheat flour). I topped the pizza with some Chipotle Pepper and Pepita Seed Pesto (recipe here) and finely chopped jalapeno peppers before topping with three kinds of cheeses: shredded mozzerella, shredded fontina and a locally made cheese similar to queso fresco. I then added the chicken sausage (2 links), some thinly sliced green and yellow bell pepper, whole kernels of corn (I used canned–but rinsed it all well before using), roasted tomato slices and additional sliced jalapenos for my spice-loving husband. I baked the pizza at a little higher temp than usual: 475 degrees F…and didn’t pay close attention, so you’ll notice I burned it a little. I kind of liked it though, it reminded me a lot of a nice, wood-fired pizza–it even had that smokiness from the chipotles! Once the pizza was finished baking, I topped it with some chopped cilantro, crumbled queso fresco style-cheese (the local stuff I used earlier) and an adobo-ranch sauce I made. I don’t like ranch dressing, but I knew this pizza would be spicy so I thought some sort of sauce would help cool it a little and also add some additional flavor. I mixed a few squirts of ranch dressing with a little bit of adobo sauce (which the chipotle peppers were packed in) until I thought it was well balanced. 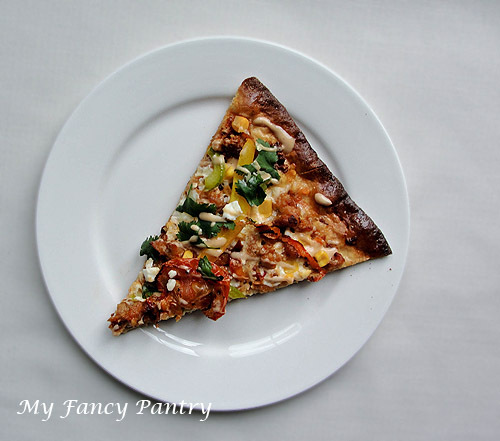 I then tossed it in the fridge for a good 20 minutes, and drizzled it lightly over the pizza before I served it. Piyush and I watched a netflix movie (some Hindi movie that I don’t remember the name of right now…) and enjoyed our pizza on the couch. 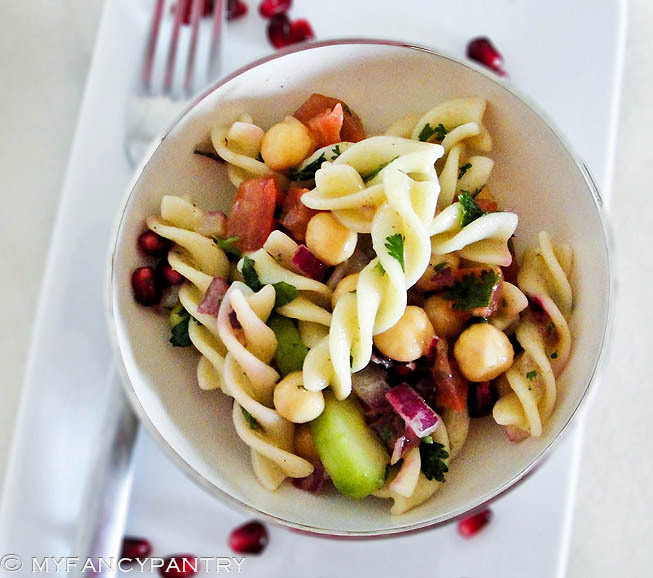 This entry was posted in Diet, Food, Recipes and tagged Chicken/Poultry, Giveaway, Pizza, Product Reviews on May 25, 2012 by Shari. It’s no secret that I love chèvre (goat cheese). 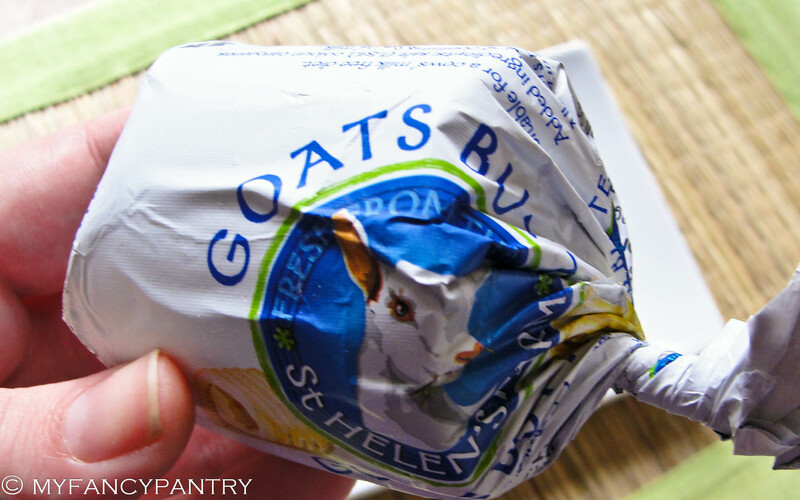 I’m always looking for ways to sneak goat cheese into my recipes…whether it be in a salad, a sauce or a soup. It’s even the “secret” ingredient to my mashed potatoes. Yum! The other night I was trying to decide what to make for supper. I didn’t really want to cook a whole lot, but I didn’t want to eat out. I looked in the fridge and saw the beautiful asparagus I purchased at the farmer’s market last Saturday. I wanted something vegetarian…and I wanted to make it a main-course. Soup was the perfect (delicious) solution! 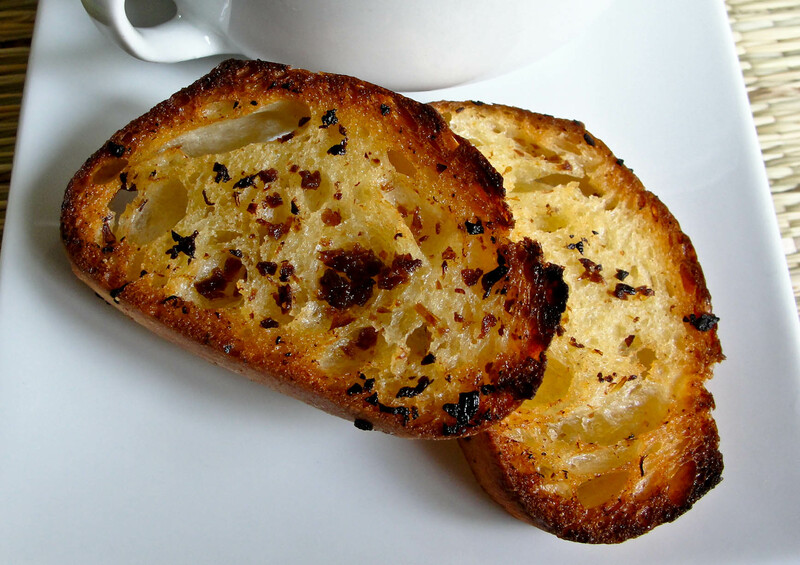 I accompanied the soup with some black garlic toasts. To make the toasts, I simply sliced a baguette. 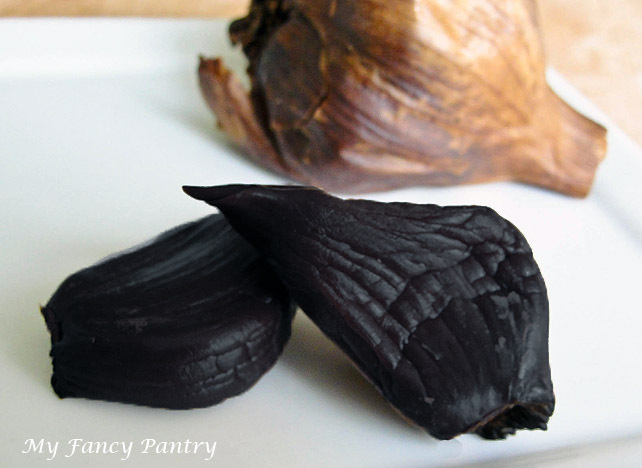 I chopped some black garlic and mixed it with some goat’s butter. 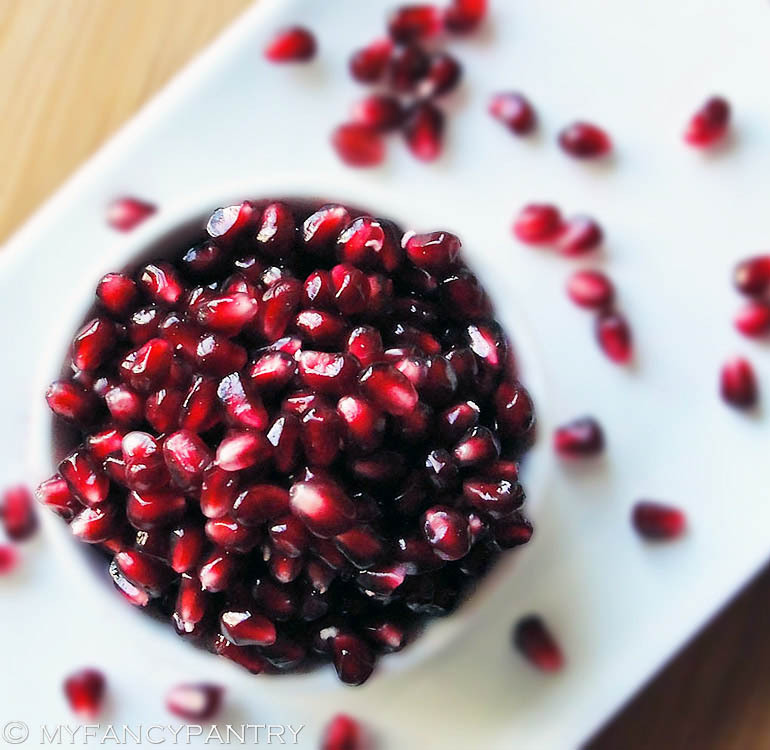 I melted the mixture and brushed it over the slices and laid them on a baking sheet–lined with parchment paper. Then I popped the baguette slices in my oven that was set to broil. I let them bake until they became golden and crispy—and delicious! The soup was equally simple to prepare, and only took about 15 minutes. 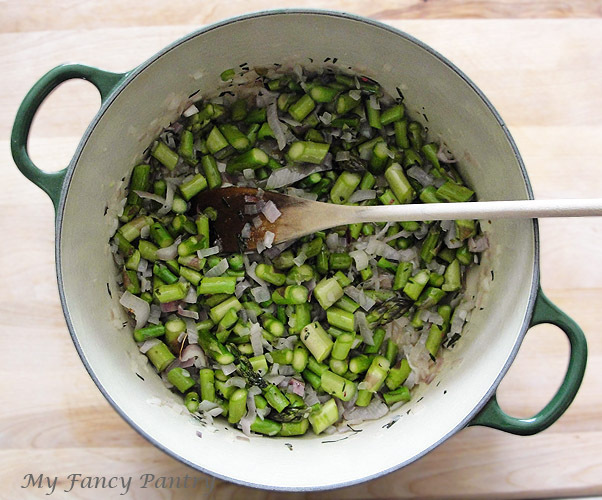 I simply sauteed shallots, asparagus and tarragon in some butter. Then I added some goat cheese and veggie stock and blended everything until it was smooth. I added a little dairy…and it was done! 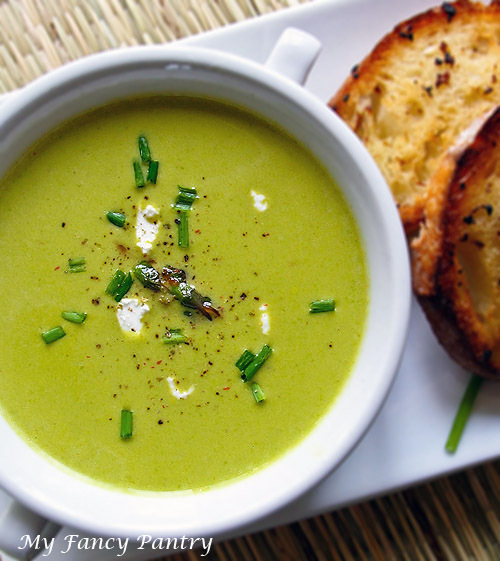 This soup would be super easy to freeze as well. Just be sure to leave out the milk and half&half before freezing. Once you’re ready to use it, allow it to thaw and then add the dairy at that point. 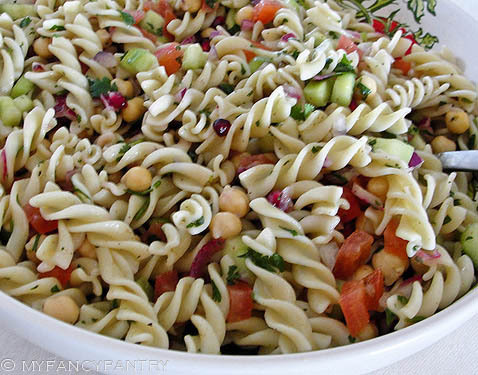 This entry was posted in Diet, Food, Recipes and tagged Soup & Stews, Vegetables (sides), Vegetarian/Vegan on May 10, 2012 by Shari. Have you ever went to the grocery store with the intention of making either fajitas or tacos that night for dinner? Did you pick up some amazingly fresh produce, buy some lovely seafood (or equally expensive chicken breasts), and then throw one of those packaged fajita/taco seasoning pouches in your cart? I have. Many times. I’m pretty sure Mexican’s don’t use soy sauce to make fajitas. Or caramel coloring. Or natural flavors. 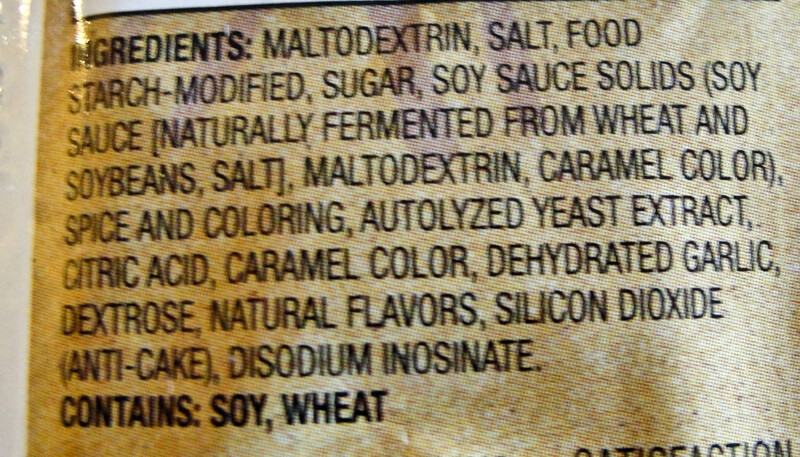 What the heck are natural flavors anyway? Shouldn’t the natural flavors come from the vegetables and the proteins? Where are the spices? After reading the back of that package, there was no way I was going to use that to make our dinner. A little salt, pepper, lime juice, cumin and chipotle would do the trick. I decided to use chipotle chile powder because it has a nice smokey flavor to it, and it’s not an artificial smokey flavor either. Chipotle chile powder is made from ground up smoked jalapenos. It’s not super spicy, but gives the dish the flavor and the kick that would be expected if you ordered fajitas in a restaurant. 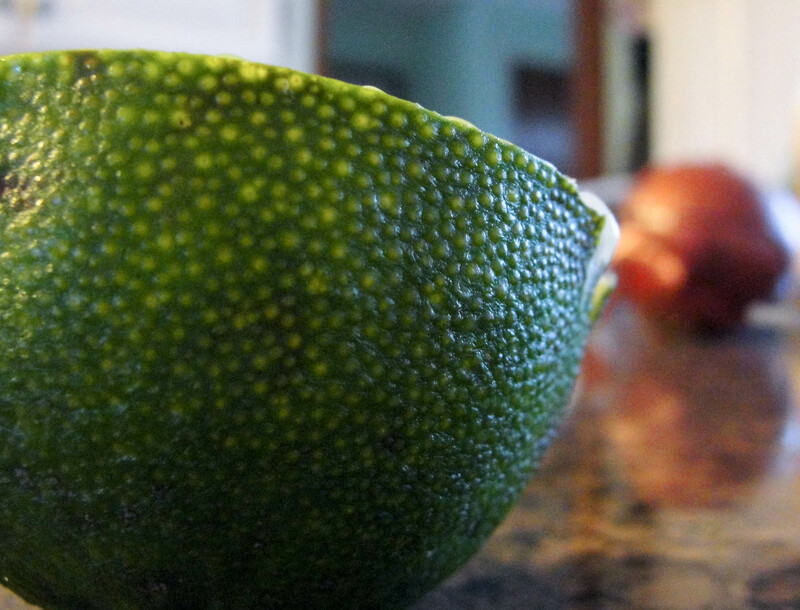 I loved the texture on my lime…it looks like it has goosebumps! I had bought a few green and red bell peppers last week, and they were starting to get a little wrinkly—the red peppers were 88 cents/each…which is a steal in our area. Here, in Rochester, red bell peppers are usually nearly $3 a piece! Isn’t that insane? One red pepper costs more than a whole pineapple! I’m glad summer is almost here so I can grow my own!!! I didn’t have any shrimp at home, so unfortunately I had to make a trip to the grocery store. I bought a little less than a pound of medium wild US caught shrimp, an onion, and a new head of garlic. When I got home I threw the shrimp in a marinade, cut up all my veggies, and got to cookin’. Cooking the shrimp—marinade and all! One thing I really love about fajitas is that you can make them ahead of time and just reheat when you’re ready to eat them. Piyush decided that he had to go golfing today, so I had no idea what time he’d be back for dinner. Once he got home (at 7:15pm), dinner could be on the table in 5 minutes. These fajitas were absolutely amazing, and ditching the pre-made spice mix made all the difference, I’m positive of it! 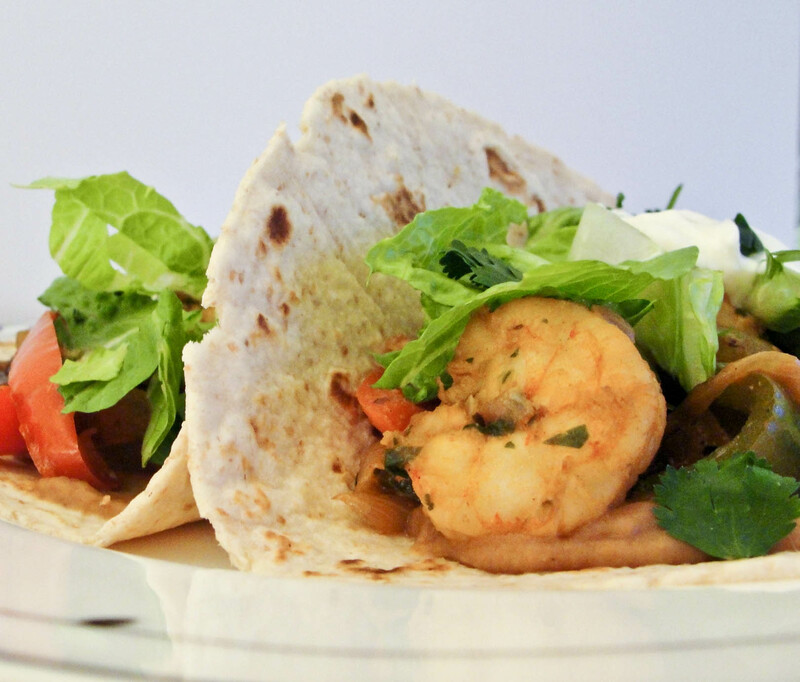 I would even go so far as to say that my version of the shrimp fajita could rival that of any restaurant! Yes. They were that good. I served the fajita mixture on high fiber tortillas (50 calories/ea) that I had spread about a tablespoon of refried beans onto. I topped them with some romaine and greek yogurt. There were some beautiful tomatoes too, but I forgot all about them until after we finished eating. Dohhh! My shrimp fajitas recipe makes quite a lot. 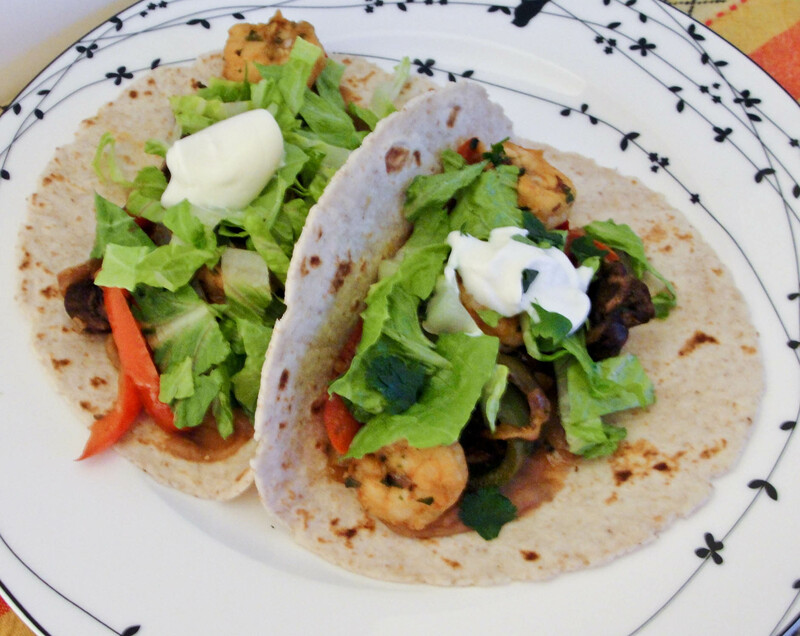 This is a really light supper, and each fajita is only around 160 calories. How exciting is that?! I had two, Piyush had three, and there is more than enough left for dinner tomorrow. I work really early tomorrow and the following day, so not having to worry about making dinner will be a good thing. That means I can (hopefully) go to bed earlier! I might even make it to the gym! Next time you make fajitas at home, I hope you are inspired to ditch the chemical packets and try your hand at making them “from scratch.” I swear it’s easy…and it’s way more healthy for you than adding a package of powder created in some lab! Rinse and dry shrimp. Put them in a large ziploc bag along with the other marinade ingredients. Toss everything together until the shrimp are all evenly coated. Let the shrimp mingle with the marinade for around 30 minutes—while you are cooking the veggies. Heat the olive oil in a large pan. Once it is hot add in the onions. Cook the onions over med-high heat until they are nice and browned. This will take around 10 min or so. Once the onions are browned, add in the garlic. Cook for about two minutes and then add the peppers. Stirring occasionally, cook the peppers until they are tender but still have a little bite to them. Add the mushrooms and cover the pan, they’ll take about 5 minutes to cook. Season the veggies with salt and pepper. 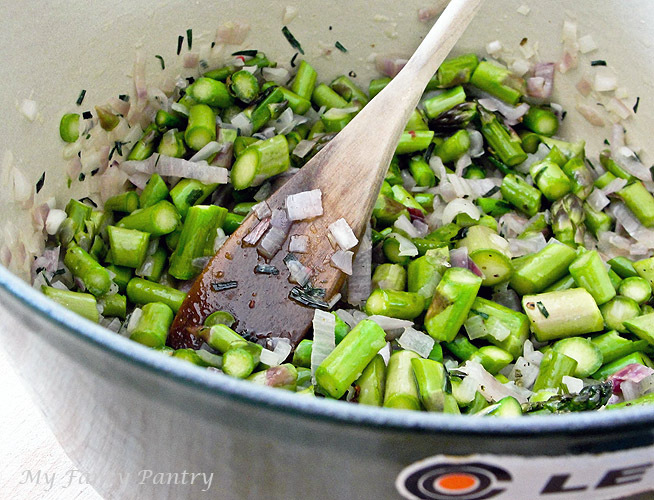 Remove the veggies from the pan and set them aside. In the same pan you cooked the vegetables, add a little olive oil (I used my misto). 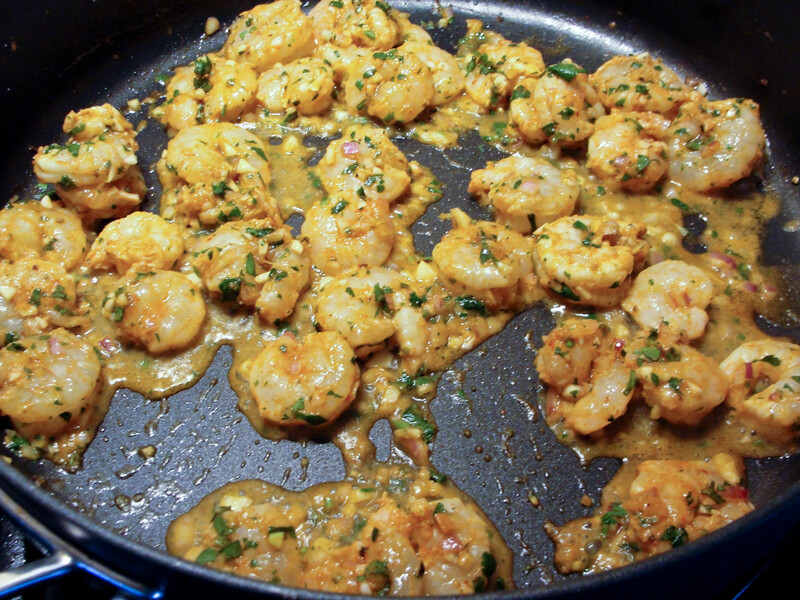 Dump the shrimp in the pan along with the marinade. Stir everything together and then put the lid on the pan. After a minute give everything another good stir and flip the shrimp. 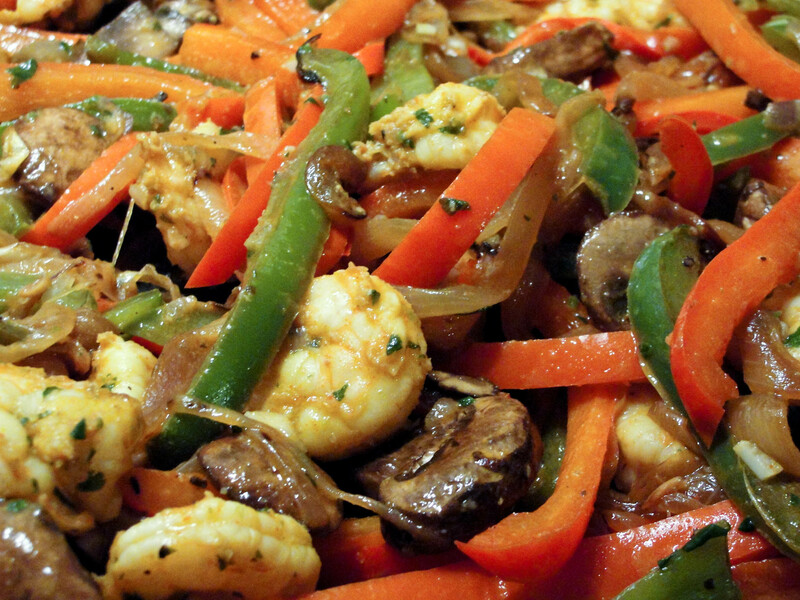 Once the shrimp have cooked for around 4-5 minutes (once the shrimp are fully cooked), add the veggies back into the pan and stir everything together. Let the mixture cook together for about 5 minutes, with the lid on. Take the lid off, scoop the mixture into tortillas, and enjoy!!! 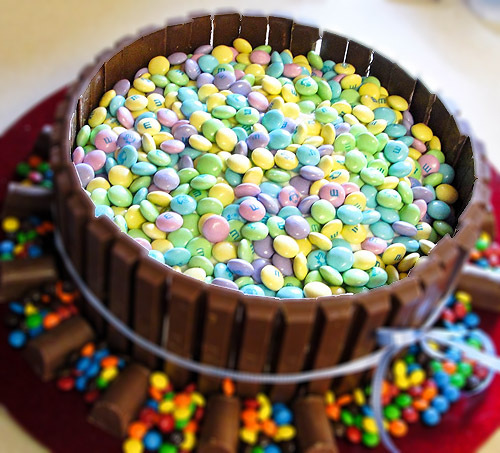 This entry was posted in Diet, Food, Recipes and tagged Fish & Seafood, healthy recipes on March 13, 2012 by Shari.